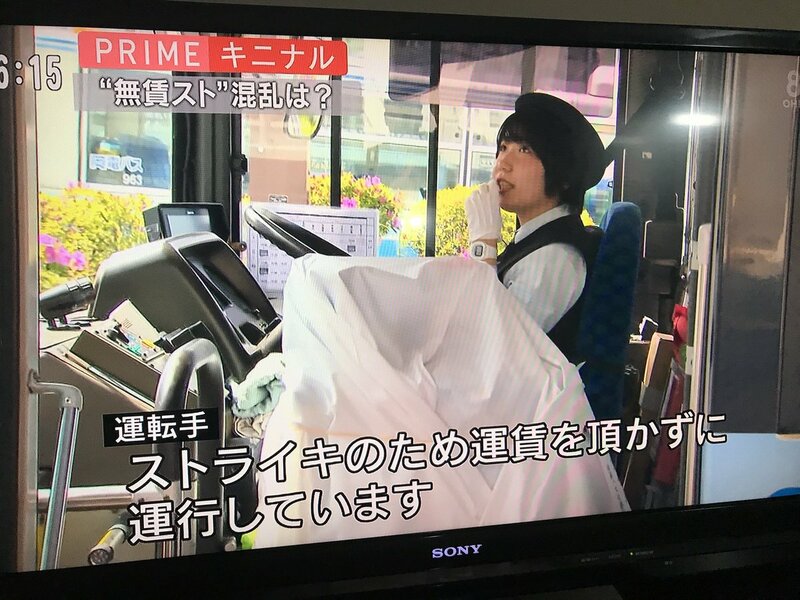 Bus drivers in Okayama working with Ryobi Group have taken to the streets in an unusual form of protest. While technically on strike, they are continuing to drive their routes while refusing to take fares from passengers. ▼ Image shows a white blanket over the fare machine. A new rival bus line Megurin began operating on April 27 with some routes overlapping those of Ryobi and offering a cheaper fare. 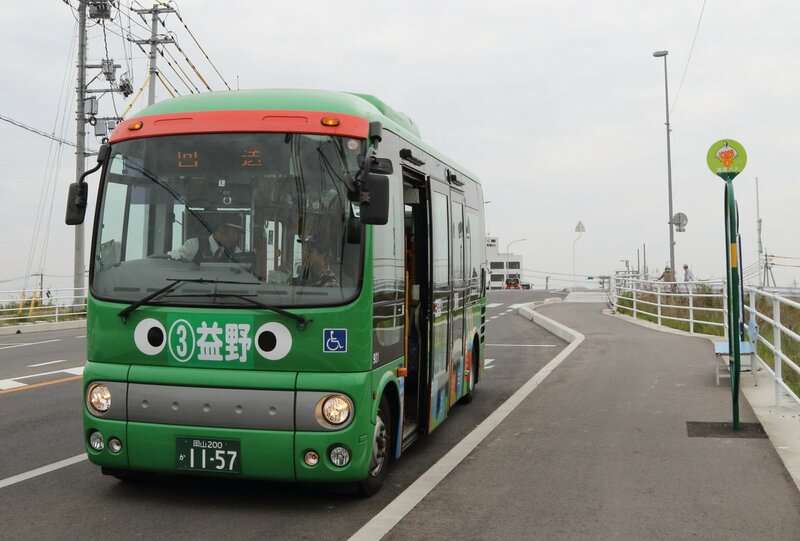 If that all wasn’t bad enough, Megurin buses have cute little faces too. As a result, Ryobi drivers are feeling threatened and are asking management for improvements to their job security under the added competition. It would seem Ryobi was less than enthusiastic to accommodate and a strike was declared. In cases such as this, management may use the labor stoppage against the drivers, appealing to the public that they are putting their own needs before the community’s. So to show that isn’t the case, Ryobi drivers are continuing to clock in, but without performing the part of their job that requires them to accept payment during certain times. In other words, free bus rides for all! ▼ The free-fare protest happened at the same time as Megurin’s maiden trip. This isn’t the first time such a strike has occurred in Japan or around the world. Both Brisbane and Sydney held fare-free days as part of labor disputes last year. The earliest documented case of a “fare strike” goes back a protest by Cleveland streetcar workers in 1944, and similar cases involving other services have happened in Europe and Latin America prior to that. Readers of the news were somewhat divided about the concept, with many wondering if it was really in the workers’ best interests. There are a lot of factors that will affect the outcome of this labor dispute, but it is an interesting experiment to see how such a strike will work in Japanese business culture among management, workers, and passengers. Considering that Ryobi drivers are looking for job security while up against a cheaper bus company, protecting their image and relationship with their passengers is crucial. So it probably is a wise move for everyone involved. This is absolutely genius. Power to the People! Way to stick it to the man! Why don't they try this method back in the UK. Trains and tubes are always going on strike. Free rides would make the man sit up and listen. I like this move. Nobody can accuse them of not considering the commuters, but the company has to react. Striking while offering passengers free rides? France, are you listening? The new bus company can only provide lower fares by paying lower fares. Unusual to have two companies on the same routes especially charging different fares so some people will wait for the cheaper bus. Same routes same fares. Strikes are very rare these days. This is more of a work-in protest than an outright protest. Who uses money on public transport any more? Would have almost zero effect. London buses haven't taken cash for years and almost all passengers on the Tube use an Oyster or contactless card. Most train travellers have a season ticket of some kind or have pre-booked. My guess is that its going to be only a matter of time before company workers around Japan will do strikes like this to protest on their stubborn employers. Imagine a peaceful "Arab Spring" for the common Japanese worker where protests, strikes and rallies would occur on an almost regular basis with the common theme: our company refuses to change or is unfair. Considering the Gen X and Y Japanese aren't as gamansuru like older generations, I could see this happening. Anyone agree? Free public transport might be the next big idea for more livable cities. @Toshihiro: My guess is that its going to be only a matter of time before company workers around Japan will do strikes like this to protest on their stubborn employers. I wish to Ghosh this would happen, but I have never seen any indication that it may occur. New employees seem terrified in my company and will obediently sit at their desk even if absolutely nothing to do. Those who do not fit into companies seem content to work part-time jobs, or just drop out of society as opposed to defying the power structure. The generation of Japanese after WWII who often displayed civil disobedience and strikes seem unique. Would have almost zero effect. London buses haven't taken cash for years. Haha...true bud. I have been in Japan soooooo long that I keep forgeting things change back home. Megurin with the cute face is not new and has been going for years. They only charge 100 yen a trip, though, and it is the overlap on their new route that is causing a potential problem. @Luddite. In London I have tried to swipe my travel pass getting on a bus, only to be waved away by the driver, indicating that his machine is not registering fares. Then I notice that the little light is off. In theory therefore, such a strike could indeed work there. This is crackers! the low bus fares of 100 to 250 yen is pretty low as it is, but to undercut this price is pretty daft, I love the way the drivers won't take any money, thats a new tactic its a win win situation, may be we should try it here in the UK, my other thought is, are the due drivers braking company rules by not taking money? Isn't this the sort of confusion that grows out of free market competition that MITI is there to protect consumers from? MITI and Keidanren will have to find some way to support the original company until the upstart competitor goes to the wall and learns its lesson... Interesting that the MoT didn't get the memo and mistakenly allowed competition on bus routes. Also, Ryobi has no way to prevent the loss of these routes to its competitor w/o the action being taken by its employees - which they seem blind to. That's the most polite and well meaning strike I can think of, no major disruption to their customers but hits the company where it hurts, while still keeping the public onside. Genius! Never use a bus because...there are none here and when I lived in the city, the seats were too small. But, protest that doesn’t involve violence gets my vote. We do in Japan. Everyday. Would love to travel there. So, let me read what the hubbub is all about. I like it! But unfortunately I have to agree with the opinion that ultimately this just gets the company more publicity and is unlikely to hurt them. The staff, on the other hand, knowing how unions work in Japan, will get canned and probably sued. Strange how people think it can’t work in London because of the Oyster card or find it odd that people use money on public transport. Are you people magically not paying? “Money” doesn’t mean cash and the drivers aren’t accepting fares in any form. You can't get in or out a Tube station without having a ticket/card. As for buses, many routes have plain clothed and uniformed ticket inspectors waiting to catch those who don't swipe. Notorious routes like the No 25 often have ticket checks. This doesn't sound like a strike, but a way that the established Bus Company can put the other one off using the same routes... as a passenger, I'd simply wait for the free bus to come along. I wonder how long the newcomer will last under those conditions before pulling the overlapping routes. Very well done report. I've just seen similiar articles in other newspapers that doesn't work it out. Many are showing this tactic as a novelty... here in Brasil is very usual, and it's called "pula catraca" (something like "jump the turnstyle").